The National Highway Traffic Safety Administration has recommended adoption of a Federal Motor Vehicle Safety Standard (FMVSS) that requires vehicles with trunks to have emergency release mechanisms for enclosed areas. Established in 2001, the FMVSS requires that mechanisms feature lighted or phosphorescent characteristics to ensure egress to anyone trapped inside. When launching their new Platinum Lid line of bed covers for pick-up trucks, Astro Cap Manufacturing wanted their release latch to be both functional and stylish. Their existing release mechanism was an unlighted steel rod, which did not meet the visibility requirements of the safety standard, nor was it stylish enough to utilize with the sleek, newly designed covers. Astro approached LeVic Plastics for a redesign, emphasizing the need for a glow-in-the-dark (GITD) part with appealing, softened lines that offered high impact and tensile strengths. These requirements led LeVic to RTP Company where they found an ideal RTP 100 Series GITD polypropylene compound. The intensity with which a phosphorescent material glows is measured in millicandles per meter squared (mCd/m2) and is an expression of light emitted from the part. The average human eye, adapted to darkness, can typically distinguish an object emitting no less than 0.030 mCd/m2. Charged with a 100 foot-candle lamp for 1 minute, the RTP 100 Series GITD compound emitted 0.032 mCd/m2 after 8 hours, exceeding FMVSS requirements. GITD compounds typically require high loadings of phosphorescent additives to obtain long duration glow properties. Unfortunately, these high loadings often cause significant degradation of mechanical properties. To balance these characteristics, RTP Company has formulated numerous GITD compounds that contain various phosphorescent pigments combined with proprietary carriers, yielding compounds with long duration glow features without significant reduction in mechanical performance. A new generation of brighter and longer glowing GITD compounds use light stable pigments that do not fade. RTP Company has formulated GITD compounds meeting the phosphorescent release handle specifications of Toyota, Nissan, Mitsubishi, Honda, Ford, Delphi, and Saab. Custom injection molder LeVic Plastics of Grandview, MO specializes medium and short run production for all industries. For more information visit their website at www.levic.com. Astro Cap Manufacturing of Garnett, KS is your trusted partner for restyling America’s trucks. 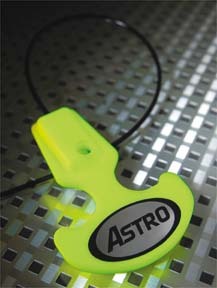 For more information visit their website at www.astro-cap.com.